I don't know where to put this but I figured here would be better than anywhere else. I just wanted to thank you for your great blog! It's almost always an interesting read and imho it beats all other SWTOR blogs I know by leaps and bounds. Actually the only two SWTOR pages I regularly visit are your blog and Dulfy's. Finally finished reading through 4 years of your blog posts. I must say that your posts are very informative, well-structured and witty. It is enlightening how SWTOR has changed and evolved over the years; through your lenses/viewpoints. It seems that many new/newbies players such as myself might have taken (the current incarnation of SWTOR) for granted..because we will never know the trials/tribulations of the SWTOR veterans who went through the evolution of SWTOR. I do hope SWTOR can continue to be successful and evolving for the better; likewise your blog as well. I do hope that you will eventually have time to play through KOTOR 1 and KOTOR 2 (with the Steam patch); though having known the ultimate fate of Revan in SWTOR might make the plot a tad redundant. However, I do agree with some sentiment that these are the best/definitive Star Wars RPG ever created; with KOTOR 1 being the heroic story; and KOTOR 2 being a philosophical one about the nature of the Force. Most average runtime quoted for both games are around 40-50 hours (I did both in 60 hours each; and that is doing almost all side-quests). At the least, we can see the precursor that SWTOR was based on (admittedly the graphic is showing its age quite a bit). I would also like to hear your thoughts about the music in SWTOR, because I think the music enriches the playing experience (for me at least). I am also curious about your thought regarding the aesthetics in SWTOR, e.g. the class starships or the different strongholds. But I understand if music/aesthetics are not your focus for your blog. Keep up the good work, Shintar! I feel like I need to both thank you and congratulate you on actually making it through the entire archives! I frequently refer to them myself, because as you say, they give quite interesting insights into how some things have changed and developed over time. I have thought about playing the two KOTORs before, but I just struggle to spend time on single-player games these days. They just feel so lonely to me without other people. MMOs have spoiled me in that regard. If you're interested in SWTOR's music, I can recommend this OotiniCast episode, where they had a guest that was very knowledgeable on the subject. I've also added music and aesthetics to my file of blog ideas for a rainy day, so you might see a post about them at some point... or not, depending on how many other things worth talking about keep happening in the SWTOR-sphere! Thx Shintar for the OotiniCast link..it is informative. I never know that there are music made out of different samples..which make me respect Jeremy Soule, the composer for KOTOR even more. Those KOTOR music still give me the chills. (The Manaan soundtrack in SWTOR is one example; evoking wonder, mystery, and the sea). SWTOR is my 1st and currently only MMO; now I can see why after playing MMO, some people might be hesitant to go back to single RPGs. In some ways, the MMO interaction is more organic and unpredictable. 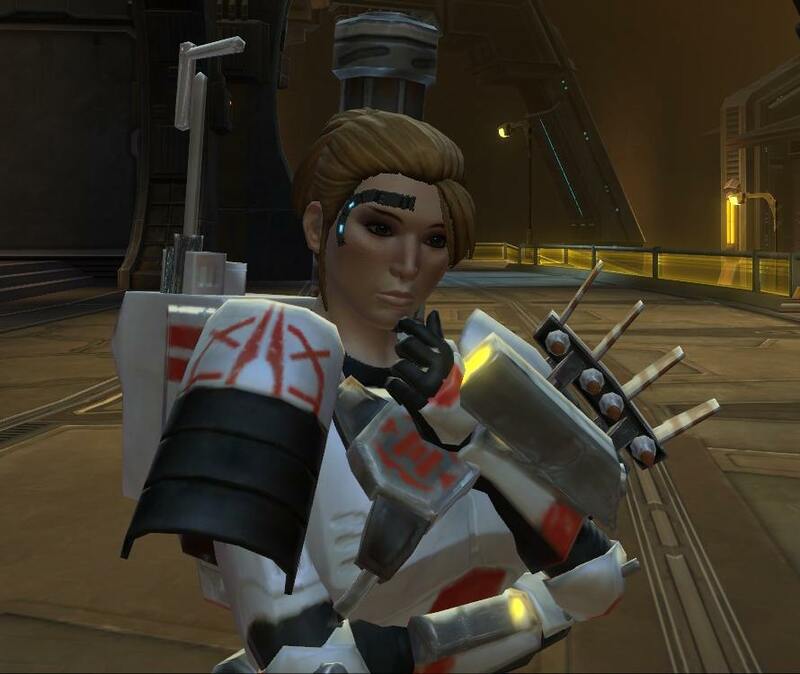 I'm coming back to SWTOR after a few years and am thrilled to see that you are still blogging about it! I'm hopeful that the Republic versus Empire theme next year will mean lots more story, which is my thing. You're welcome? ^^ I'm excited about the new story as well, though I'm trying not to get too excited to avoid setting myself up for disappointment. There should be four sub-stories to play through, sort of: Republic, Empire, and the traitor version of each.